Annual Subscription of $95 AU for 4 editions per year. ie Spring, Summer, Autumn, Winter. Sent direct to you from the publisher. 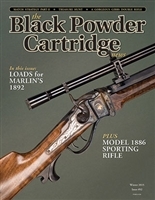 The Black Powder Cartridge News is the only magazine in the world dedicated to the black powder cartridge rifle. The magazine targets the avid shooters and competitors in the black powder shooting world. We cover the rifles, powders, reloading and competitions for the black powder community. The Black Powder Cartridge News is written by shooters for shooters.